Limagrain UK is launching the new soil conditioning package, Smart Rotation SR2 this spring (2017). It will be demonstrated at the Grassland and Muck Event, Stoneleigh, May 24/25, 2017. 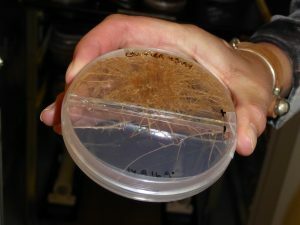 This unique combination of microbes includes five isolates of Arbuscular Mycorrhizal Fungi (AMF) and five races – or strains – of plant growth promoting Rhizobacteria (PGPR). It has been developed to improve soil health and crop production and can bring long term benefits to grass, cereal and maize crops. The mycorrhizal fungi increase the plant’s root system, leading to dramatic improvements in absorption area by 100 to 1000 times and therefore boosting its uptake of nutrients. A sticky glycoprotein produced by the mycorrhizae encourages soil aggregation and accounts for 27% of the carbon in the soil. The rhizobacteria fix atmospheric nitrogen and also have bio-stimulant properties that improve root development and will enhance the action of the package of mycorrhizal fungi. “UK developer, PlantWorks, has shown that the combined action of the mycorrhizal fungi and rhizobacteria contained in Smart Rotation SR2 outperforms the performance of a control with no inoculant and of just applying one of the two groups of microbes,” adds Mr Misselbrook. SR2 works on a compatible host plant and can be used with grass seed mixtures and non-brassica cover crops. “Growers can mix SR2 with the seed at drilling or work it into the seedbed prior to sowing and the benefits can last for the life of the crop. Limagrain UK is the local agricultural seeds operating company of Group Limagrain. Limagrain is an international agricultural co-operative group, specialized in field seeds, vegetable seeds and cereal products. Founded and managed by French farmers, the co-operative is anchored in Auvergne, the region of its 2,000 farmer members. As the 4th largest seed company in the world, European leader for functional flours and the largest French industrial producer of bakery products, the group makes annual sales of almost 2 billion Euros. It has a headcount of nearly 8,200, spread out over 39 countries, including more than 1,750 employees in research. It conducts its business within the framework of a global, sustainable vision of agriculture and agri-food based on innovation and regulation of agricultural markets.